On the 25th October 2017, we left Penang and got a five hour bus to the Cameron Highlands which is a mountainous region in western Malaysia. We would only be here for a night but had got an early enough bus to get a packed 24 hours planned. After checking into our hostel we went on the search for lunch and found a nice little street stall across from the main road in town that served veggie spring rolls and deep fried bananas. We soon found out that deep frying food was a popular thing to do in the Cameron Highlands, something we could definitely get behind! The food was great (and really cheap) and we were really full when we started exploring the area. The Cameron Highlands have created a range of tracks in the area so that you can trek through the mountains and jungle without getting yourself lost or in trouble. 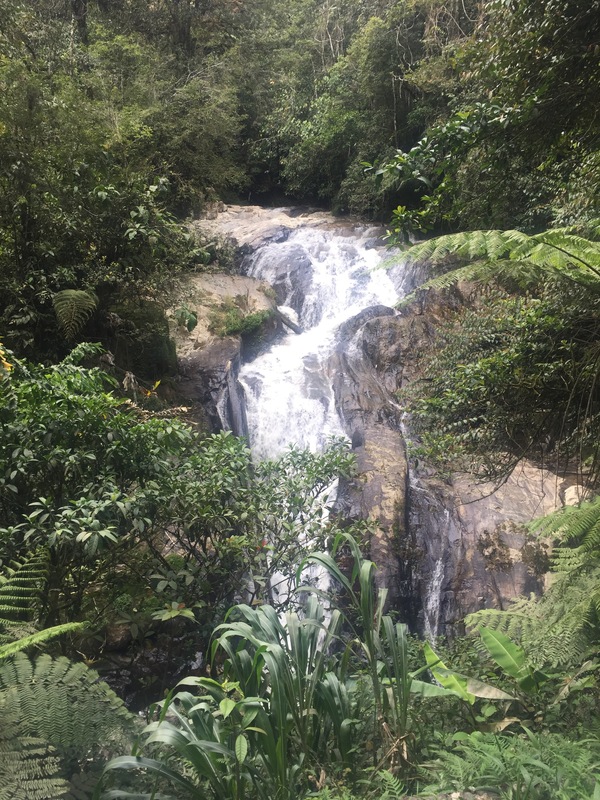 We aren’t avid hikers and weren’t really feeling like doing anything particular challenging so we chose walks number 4 and number 9 that weren’t very long and took us to see some waterfalls without any super steep hills to climb. Route number 9 took us along the river to the Robinson’s Waterfall which was reasonably big in a bit of thick forest. This was quite a popular walk and so the track was clear and easy to walk along without getting muddy or scratched by the plants on either side. I don’t think the waterfall (either of them for that matter) would be in our top waterfalls of the trip but it was still a nice walk and the temperature was a lot cooler here so we were happy to be out and about. 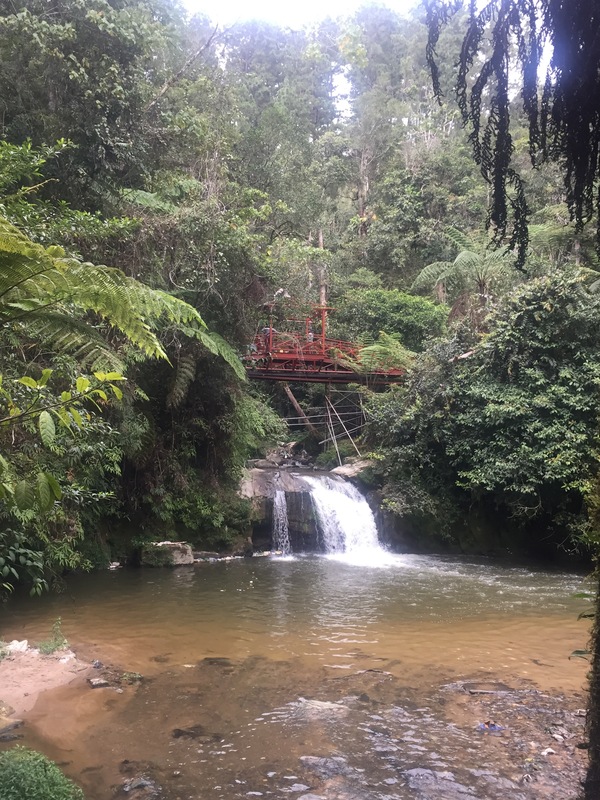 Track 4 took us to Parit Falls but this was only a little waterfall and they were doing work on the bridge that crossed the river by the falls meaning that we couldn’t continue the track. We didn’t mind though, it had already been a co﻿uple of hours and so we went and sat in the local park instead. One thing that has happened a lot during our time in Malaysia is that little children are fascinated by us. They often stare at us and some have been very interactive with us as well. One baby in Penang was staring at us for the full time we were waiting in a queue and Niall loves to insist that I was at fault for making the baby cry (I didn’t do anything so I definitely didn’t) and we had two young children wave and stare at us from the seats in front for the full flight from Singapore to Malaysia. I’m telling you this as somewhere in the Cameron Highlands there is now a family who has a picture of us both with their little boy. He waved to us while we were in the park so we dutifully waved back and soon his dad had him by our side, getting him to say hello to us while he started taking a lot of pictures! We didn’t make a fuss and the kid was very cute so it wasn’t an issue but it is funny to think that he now has a picture of us to show to his friends and maybe even put on Facebook! We didn’t have a big tea that night but did have some churros from a little stall at a market which was both random (not what you expect to find in the middle of the middle in Malaysia) and very tasty! It was probably a similar temperature to a standard summers day (not one of our rare super hot ones) which we really enjoyed especially after having some very hot days in Penang but it did mean that we didn’t stay out as late in the evening as it wasn’t as warm – also it seemed like a lot less common thing to do in the mountains compared to the busyness of everywhere else at night in Malaysia! We were leaving the next day at 2:30pm and so had booked onto a half day tour that would have us back at our hostel before 2pm. 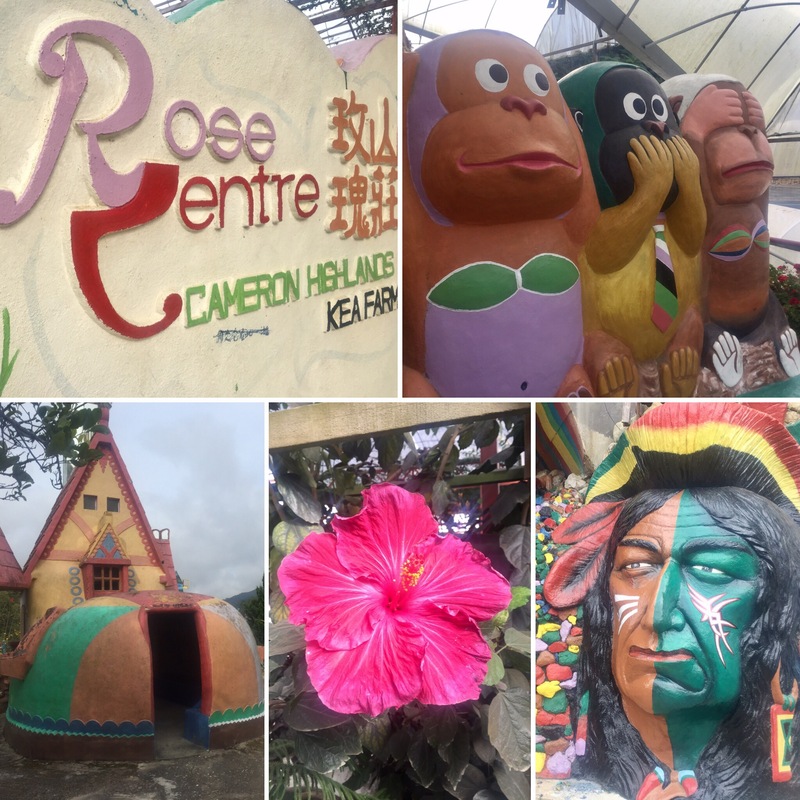 The Cameron Highlands has loads of tour companies offering very similar trips for similar prices so we had just picked the one that was the cheapest and would get us back in time for our bus. When we were picked up at 8:45 that morning, we were surprised to be the only people on the tour! Our first stop of the tour was to a rose garden. Every last bit of this place was painted in different colours and covered in a variety of pictures. 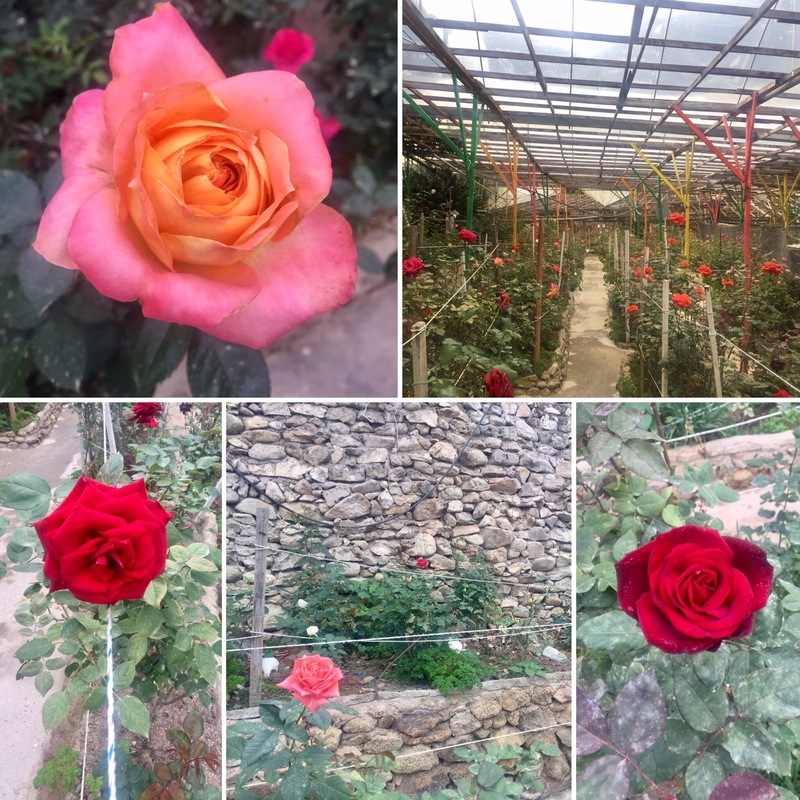 As you’d expect, there were loads of roses and other flowers being grown here. Our guide had told us to head straight to the very top of the gardens as it gave great views over the mountains. It was amazing to see the volume of farming done in the area as it was all you could see off into the distance! I guess they need to exploit the space they have here with the weather being so good for growing crops. They also have lots of tall blocks of flats, probably also to save space for farming. 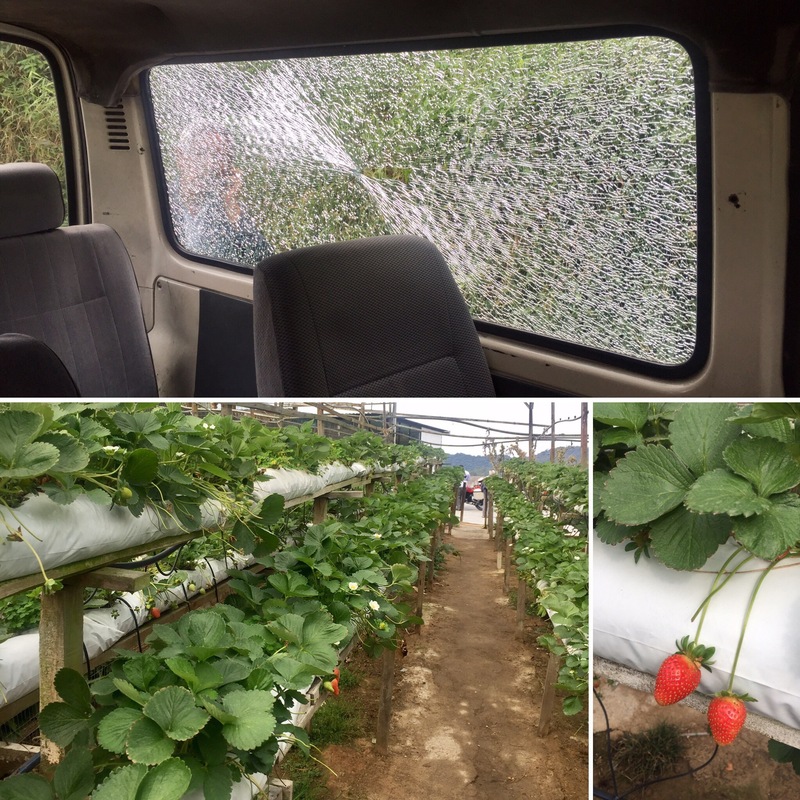 After the rose farm, on our way to our next stop, a grass strimmer accidentally shot a stone into the road which hit the window of the mini van we were in and shattered it!! We were both fine, I had been sitting next to the window on the way to the rose garden but luckily had moved to a different seat before we drove off so I wasn’t next to the shattering bits of glass! It was interesting to see how the driver reacted and I couldn’t help but think how differently it would have been handled in the UK. The driver wasn’t very happy (obviously) but just called his boss and then got back into the bus to carry on our tour. He didn’t go and shout at the man with the grass strimmer and didn’t stop our tour which would have 100% happened in the UK! Our next stop was a strawberry farm. This was just rows and rows of strawberry plants and, unlike some we had seen advertised in the area, you weren’t allowed to pick them. We got to try some of the strawberry jam they made here though which was really good. Strawberry jam is so sweet in Malaysia but the company all did a reduced sugar version which tasted a lot more like the jam at home and that one was my favourite. 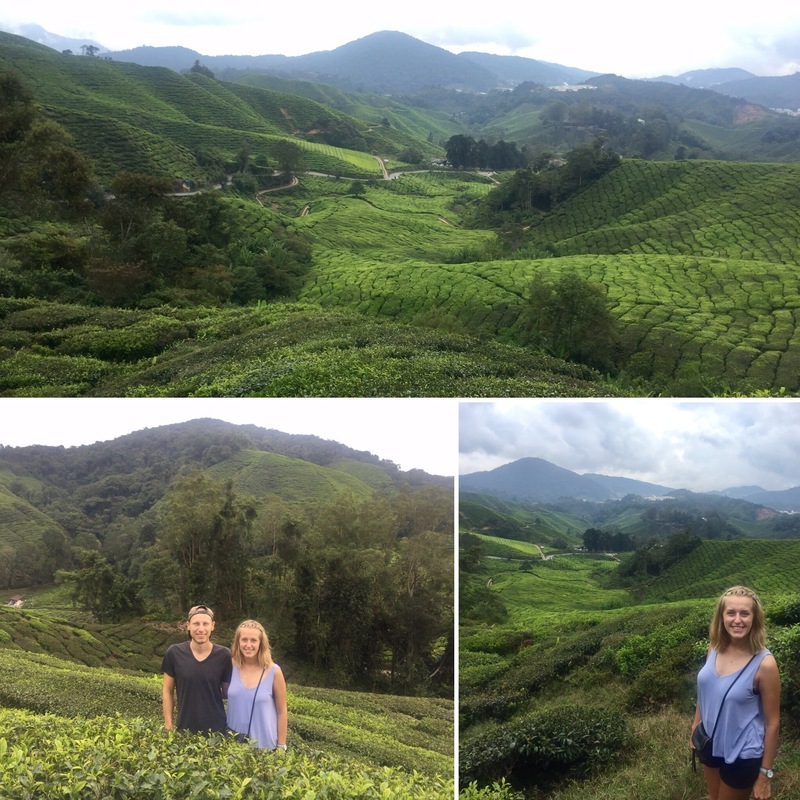 The main stop of the tour was to the BOH tea plantation. This brand of tea is owned by a Scottish family who moved to Malaysia in 1929 to start making tea. It sells 5.5 millions teabags a year and is the most popular tea brand in Malaysia. Our guide told us how they used to hand pick the tea leaves which must have taken ages but now they have tools to help them. If the ground is flat then they now use a machine held by two people that they can move across the top of the hedge, cutting the leaves and blowing them into a bag attached at the back. On the slopes they use a pair of shears that had a container attached to catch the leaves as they’re cut. It may sound strange to you but we didn’t realise it was just normal looking leaves that made tea, although that makes sense really that they would be! We got to look around the factory which wasn’t on at the time due to a low harvest but was still interesting – I didn’t know the tea leaves were fermented. We ended our time here trying one of their teas; strawberry and raspberry flavour. Though the best bit of this place was the views of rows and rows of hedges of tea leaves going on for miles into the distance. We stopped off at a honey farm which was really busy. 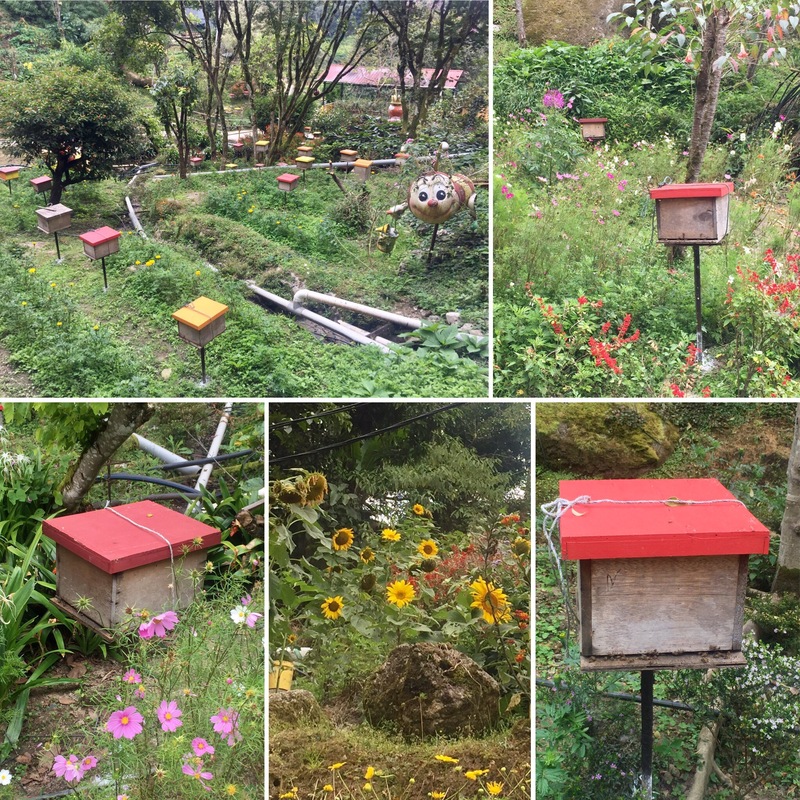 There was a maze you could pay to do and then you could go into the gardens where all the bees were living in little boxes with their hives in. You did this at your own risk of being stung which thankfully we weren’t although one did fly at Niall and hit off him, maybe as a gentle warning to go away. You could taste and buy their honey here which was really good! After the bees we moved on to butterflies. 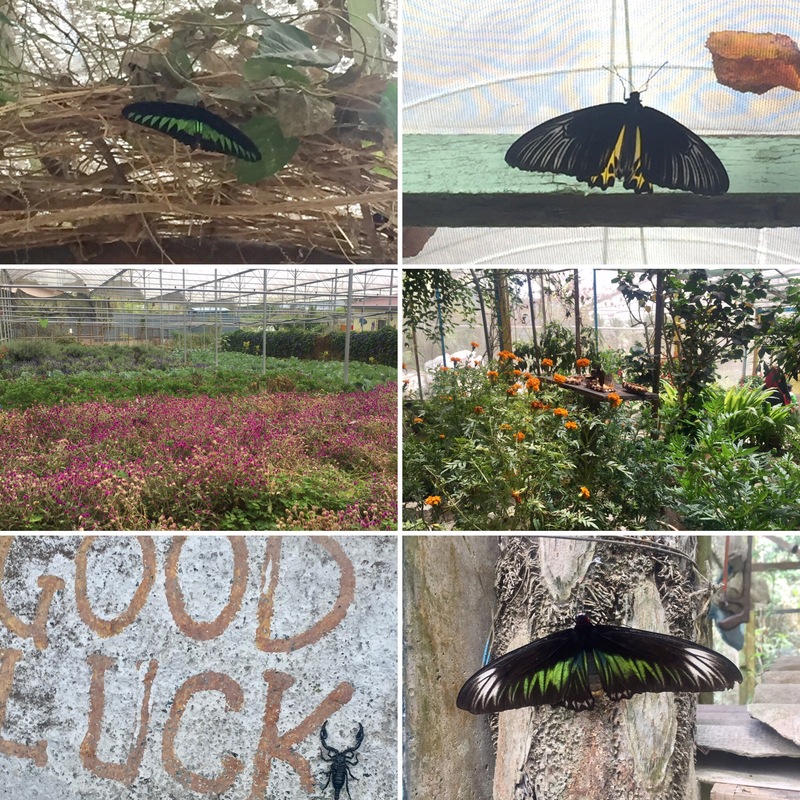 The butterfly farm took you through a doorway into a netted garden where there was a range of different butterflies as well as some in pupae ready to transform from caterpillars into butterflies. Some of the butterflies were massive! As soon we walked in a butterfly landed on us and one tried to land on my face which meant I was stuck with my eyes closed hoping for it to leave for a couple of seconds at the entrance! 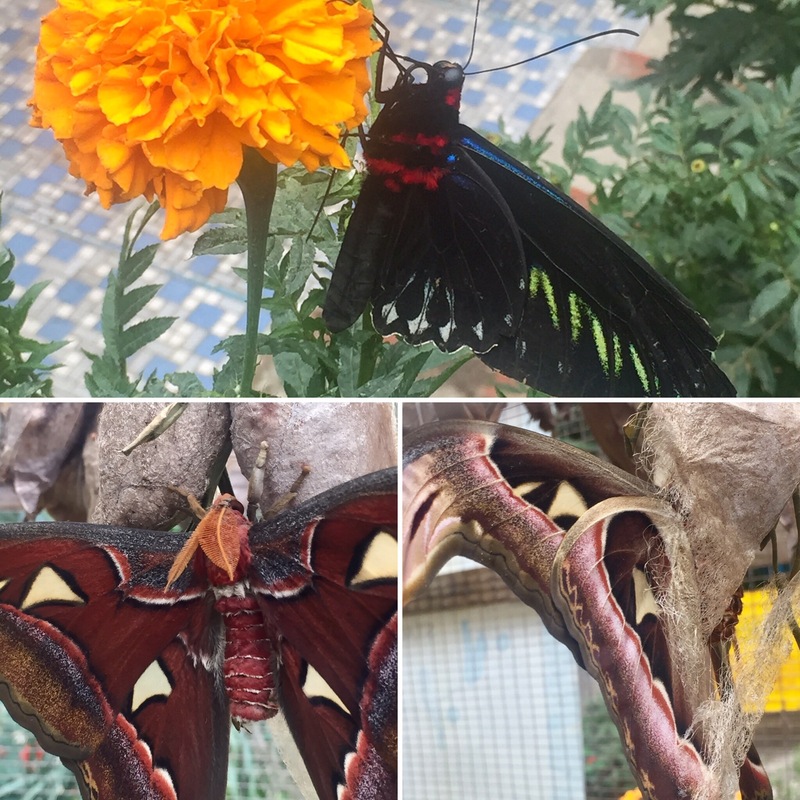 The butterfly farm also has some gardens and a range of other animals and insects such as rabbits, turkeys, scorpions and stick insects. It was nice to see so many butterflies as they were really pretty but the place isn’t massive so you don’t need to be here for long. 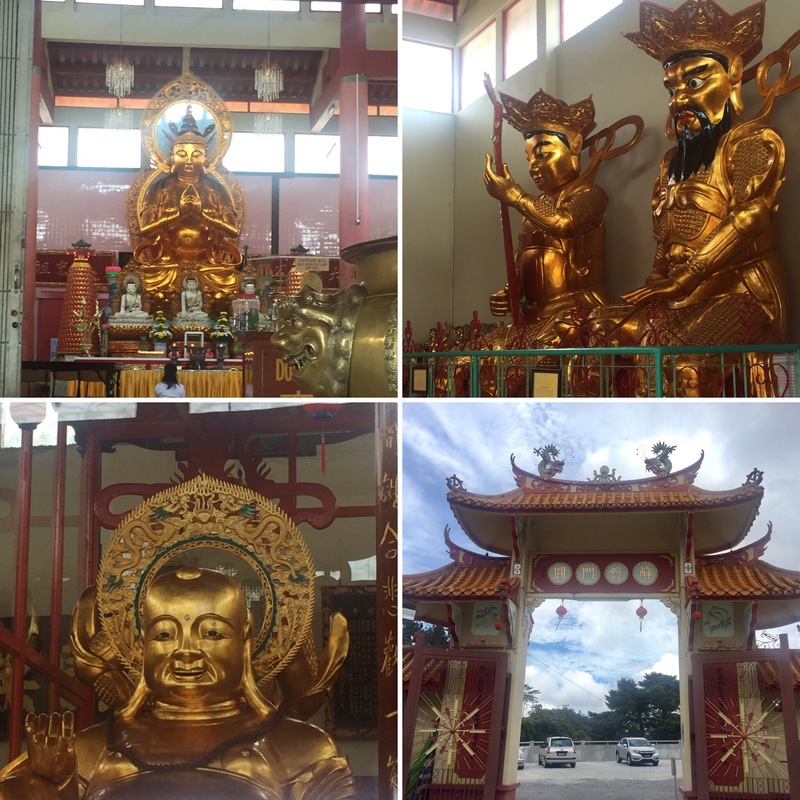 Our last stop of the day was to a local Buddhist temple. 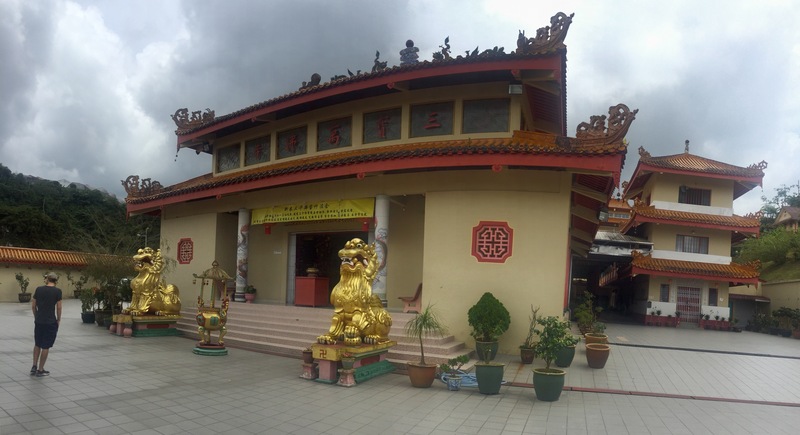 It didn’t take us long to look around and, although still nice, wasn’t anything particularly special considering some of the temples we have already seen in Malaysia. We enjoyed our tour and because there was only two of us we were back in plenty of time for our bus to Ipoh. 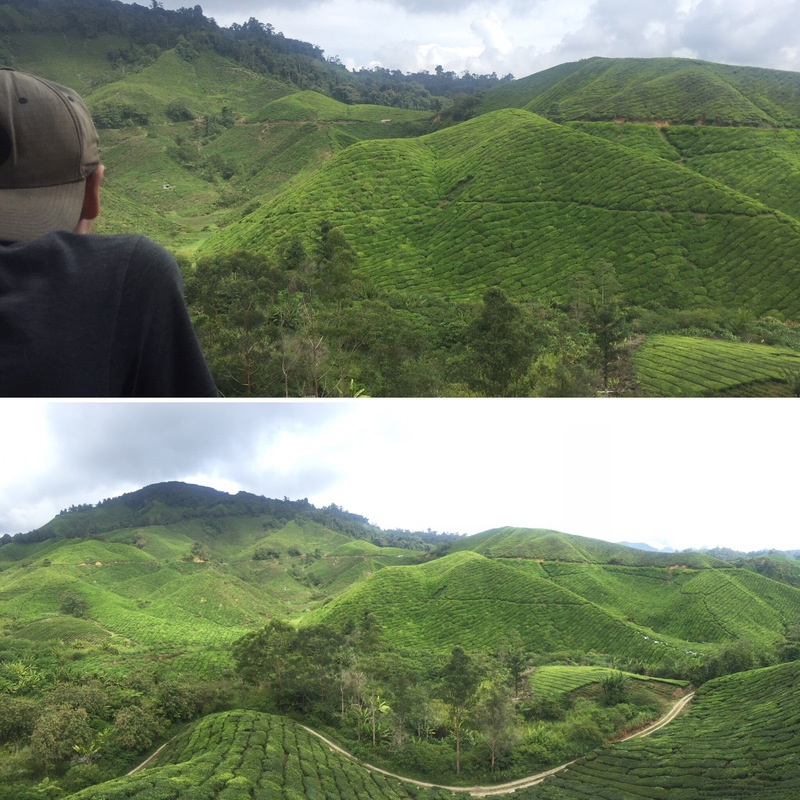 I would recommend stopping in the Cameron Highlands for a day or two (a couple of days if you want to do more hiking) as it’s a nice break from the heat and is a calm and pleasant place to relax. Even just for 24 hours, it was worth going.